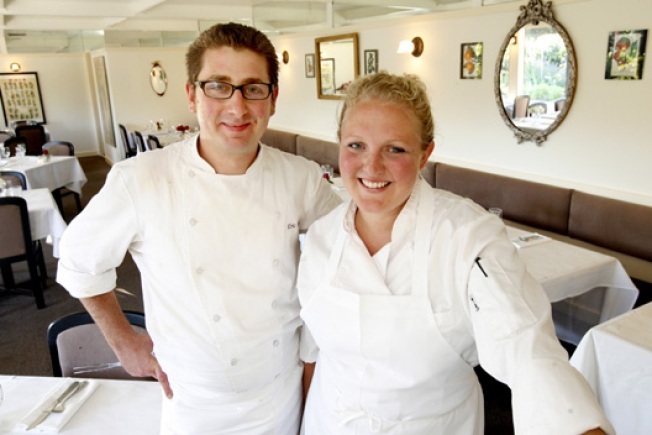 Eric Korsh, left, and Ginevra Iverson, right, the owners and chefs at Eloise, a restaurant in Sebastopol, Calif. on Thursday, Sept. 4, 2008. Late Wednesday, Ginevra Iverson and Eric Korsh announced that they would be shuttering their Sebastopol eatery, Restaurant Eloise. Their last day will be Sunday, November 29. It's a sad loss, especially since it was such a personal restaurant and so widely praised. Josh Sens (three stars), Jeff Cox (three stars) and Patricia Unterman all filed raves, plus Bauer gave it 2.5 stars and agreed that it was a "must-visit place." Based on the outpouring of internetgrief, it's obvious that Eloise was a fan favorite. It is with much sadness that we are writing to tell everyone who has supported Eloise in the past sixteen months that we have decided to close the restaurant as of Monday, November 30th. We will continue with normal service through Sunday, November 29th and would love a chance to say goodbye to any of you who would like to come in before then. We thank each of you for your patronage, enthusiasm and encouragement. We have loved serving you and look forward to a time when we may meet again.